While many are affected by emotional disorders in varying degrees, the extent and frequency of the disorder is found to be more among women and adolescents, claimed psychologists at Pandit Deendayal Petroleum University (PDPU) on Thursday. 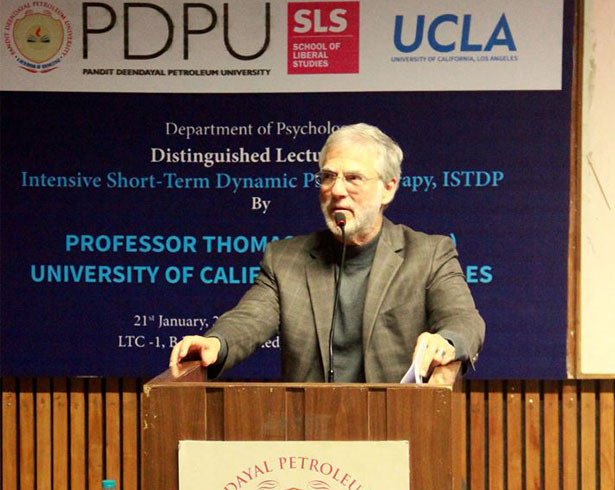 The Department of Psychology at the School of Liberal Studies (SLS), had organised a lecture on ‘Intensive Short-Term Dynamic Psychotherapy (ISTDP)’, by Professor Thomas M Brod. ISTDP is a psychodynamic treatment which is specifically designed for emotional disorders that facilitates quick treatment of most of them. “The therapy helps the patient overcome their own internal resistance to experience their true feelings about situations, which they warded off as they’re too painful to experience,”said Dr Brod, adding, that the treatment has been proven successful for patient therapy and also in treating other severe extents of emotional disorders.
" To be an internationally renowned and respected institution imparting excellent education and training based upon the foundation of futuristic research and innovations."